Tampax?s N°1 combination of comfort, protection and discretion. Tampax MotionFit tampon that gently adapts to your body?s unique shape. Leakguard Braid for added backup protection to help prevent leaks. SmoothTouch compact applicator with an anti-slip grip and rounded tip for easy tampon insertion. Independently tested for harmful substances by Oeko-Tex. Gynaecologically tested. Free from fragrances and core free from dyes. For more information about our products please visit our website. Tampax Pearl Compak tampons are our best tampons for comfort, protection and discretion. They are free from fragrances. Tampax Pearl Compak tampons come with a compact and discreet smooth plastic applicator and rounded tip for comfortable insertion. Its contoured Anti- Slip Grip makes the applicator easy to hold and position. Tampax Pearl Compak has MotionFit technology that gently expands to fit your body?s unique shape. Additionally there is a LeakGuard braid that helps stop leaks before they happen. Tampax Pearl Compak have bold and colourful wrappers that are easy to open, purse resistant and open silently for full discretion. 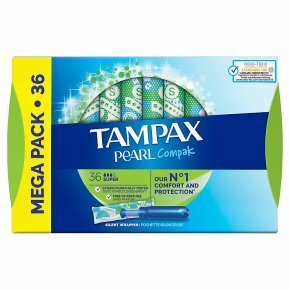 Tampax Pearl Compak Super is our best tampon for super absorbency. Tampax Pearl Compak tampons have been gynaecologically tested. They have also been independently tested for harmful substances by Oeko-Tex. For more information about our products please visit our website. Tampons are associated with a rare but serious illness, Toxic Shock Syndrome (TSS). TSS is a rare but serious illness that may be fatal.